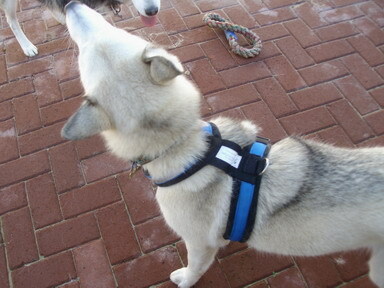 The photo above illustrates an X-back harness. X-back, H-back, Long distance harnesses and many more. Most regularly used is the X and H-back harnesses. I recently bought this type of harness for my dogs and I was pleasantly surprised. This works well for when your point of attachment is higher like with a scooter. What’s most important is that your dog is comfortable. The harness must not pull up her back when leaning into the harness and pulling. When dressing your dog in harness it’s best to stand with your dog between your legs with her face facing away from you. When putting the harness over her head remember to take her collar out of the way. You don’t want to take her collar of completely especially if you intend to neck line another dog to this dog. 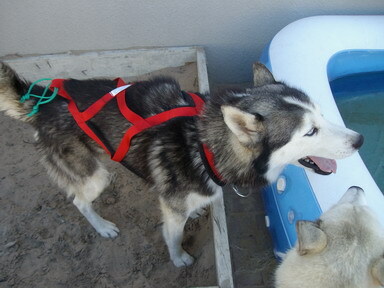 Just take the collar out of the way of the harness so that it can go on top of her neck. 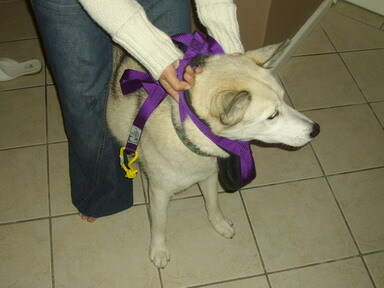 If you do decide to remove her collar it is fine and then just attach it after your dog is dressed in harness. How to dress your dog in a X back harness. First take the round loop and put it next to the part that will go over the dogs back. This is also where the feet will go through on the sides. Then pull it over her head. Make sure that you get her ears through without hurting them. When that is done pull the collar through. Now put the legs one by one through the side loop holding her leg bended backwards next to her body. Do this while standing over her. 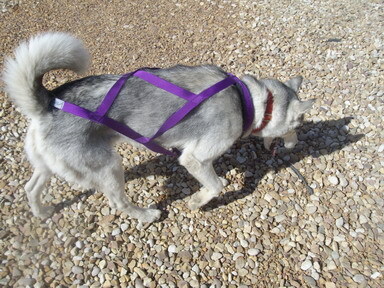 Then after her legs are through the side loops make sure that the harness is a good fit. Check to see if you are still able to put your fingers between her neck and the harness. Also see if the harness is not too big as it will make pulling in harness difficult and can irritate her skin through friction. 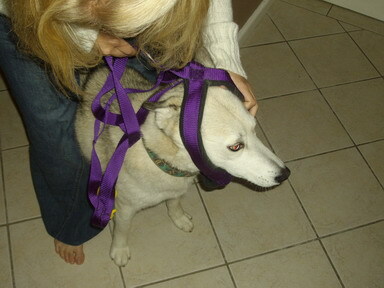 My first harness that I put on our dog Gephetto was way too small… I had such a struggle to get it off again. Shame the poor guy even helped me by pulling backwards as I was trying to pull it off his neck and face. He knew I messed up but still loved me in spite of it all. We have come along way since and by being who they are we have come to have a lot of fun. It’s a good idea to let your dog walk in her harness a few times before starting to train. This will make her get used to this new piece of clothing and make training easier. Never leave your dog unattended in it though as he can bite on his harness. Please do not let your dog pull on his collar she can seriously injure herself. …don’t let these words scare you. A joring line is a rope that attaches to you or your scooter/bike. 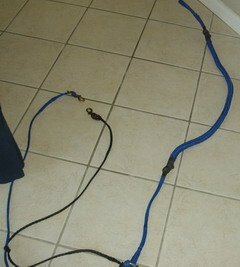 The tug line is the line attaching to the joring line and to one or more dog harness. The neck line is the "rope" attaching the dogs by each others collars so that they run together.